Cuckoo for Coconuts: CAN YOU DIG IT? 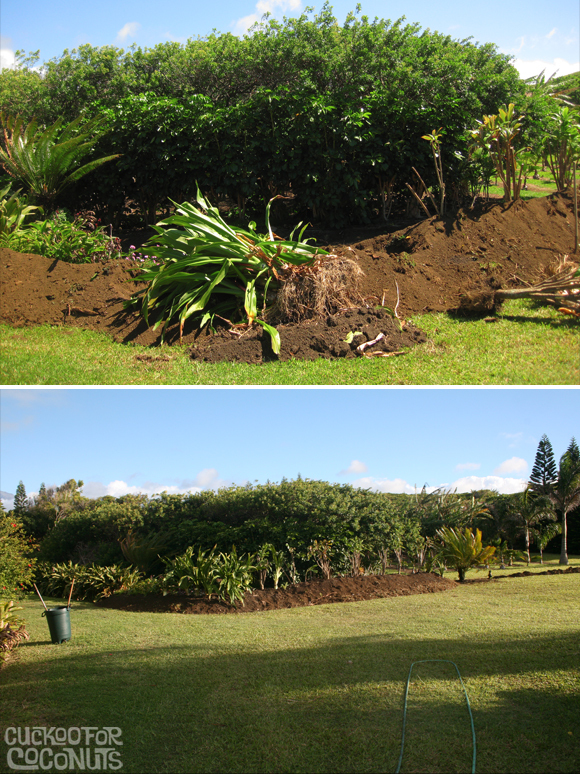 Now that we have all the areca palms dig up from the new garden shed location, we had a few ti and lilies to move. 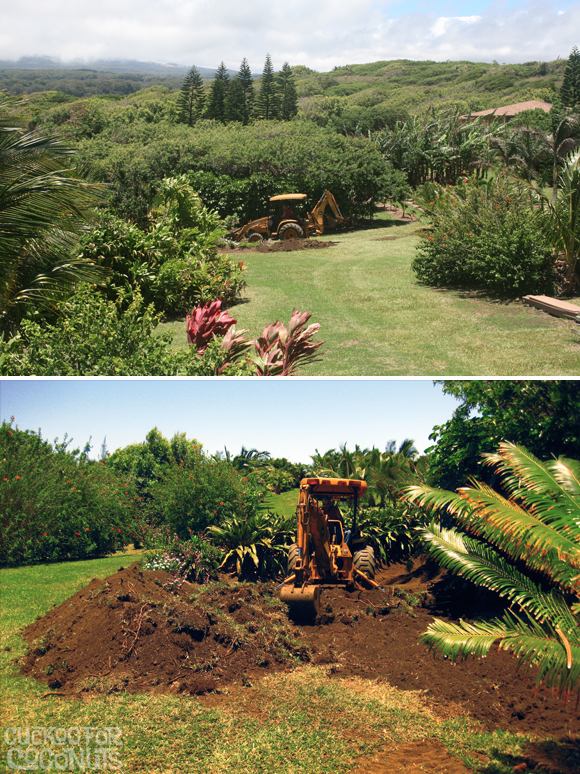 With almost 80 palms left to plant and over 200 feet of dirt to dig for the south hedge... we knew it would take us another year to do it all by hand as we did with the north hedge. Therefore we called in a pro, our neighbor Murray who also helps maintain our road. Murray showed up with his tractor and dug in. In what would have taken us at least 3 weeks to do by hand... if we worked on it every day or a year if we did it in small sections... Murray finished in just under 3 hours. While Murray dug, I worked on the computer and made the money to pay him. We say it's the best money we have spent here so far. We wanted a 2 foot wide by 200 foot long trench along the southern property line so we could plant areca and maybe some panax as a hedge. 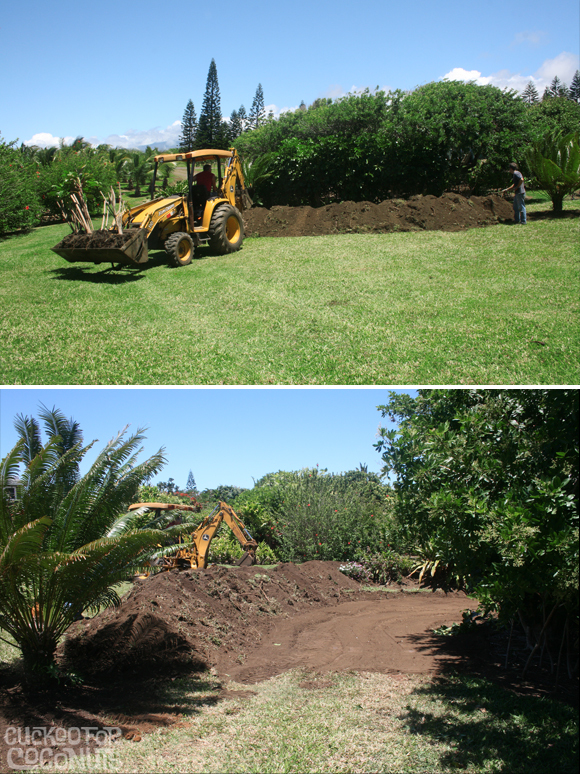 We also wanted to make our water retention pool larger on the southern edge as well. This area collects water a few times a year when we have stalled storms. We ended up making it almost 30 feet longer and 12 feet across. With all the extra dirt we built a berm and are set to planting on it right away. We wanted to get as many plants on it as soon as possible so the roots would start to take hold and hold back a good amount of dirt. The ti and lilies that we dug up from the garden area line the top of the berm. 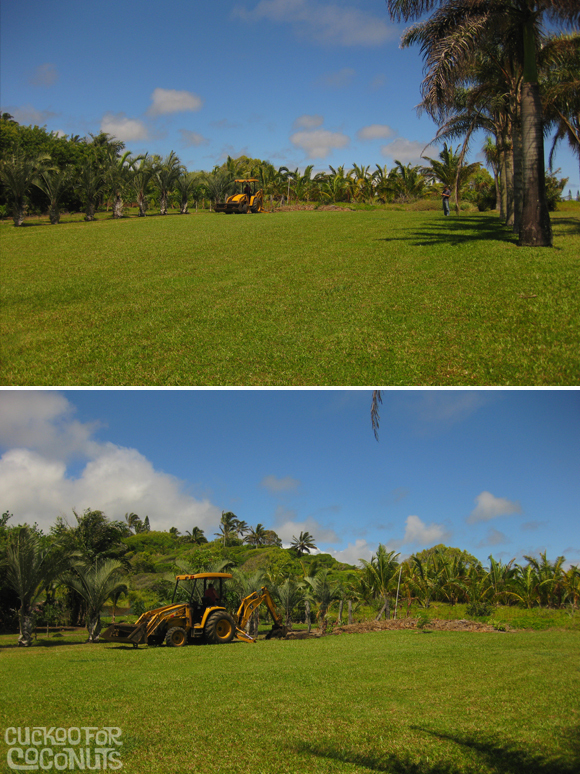 We just started to get the areca palms in the trench and have about half to place. They have been in pots waiting to be planted in their new home since we dug those up almost 2 months ago. 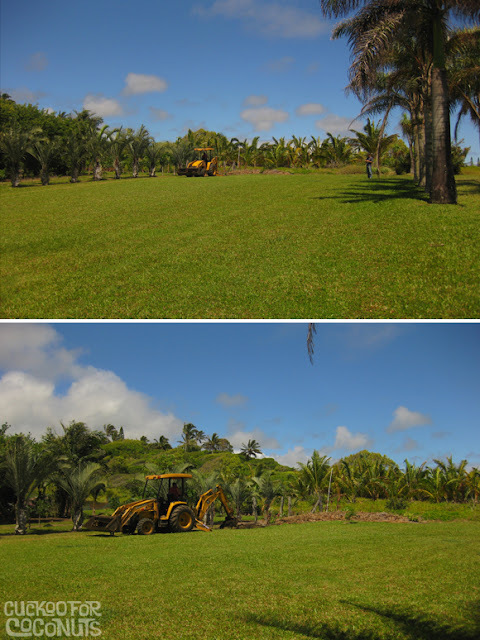 Here you can see the berm we created last summer. And a view from the office lanai / my desk. So that Murray knew where we wanted the berm and trench to be, we marked the lawn with orange spray paint. The sago palm down in the pool will later be relocated. 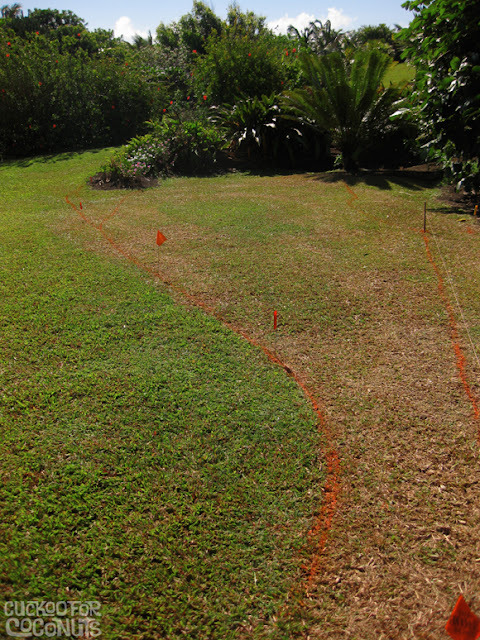 First up, Murray starts turning the dirt on the southern edge of the property. You can see we have created a mulch berm there in the back corner. This will eventually have a row of ti planted in front of it to help hide all the cuttings we will be tossing there. About 20 minutes later and the trench is about half finished and 40 minutes later he's done with that and ready to move onto the berm and pool. 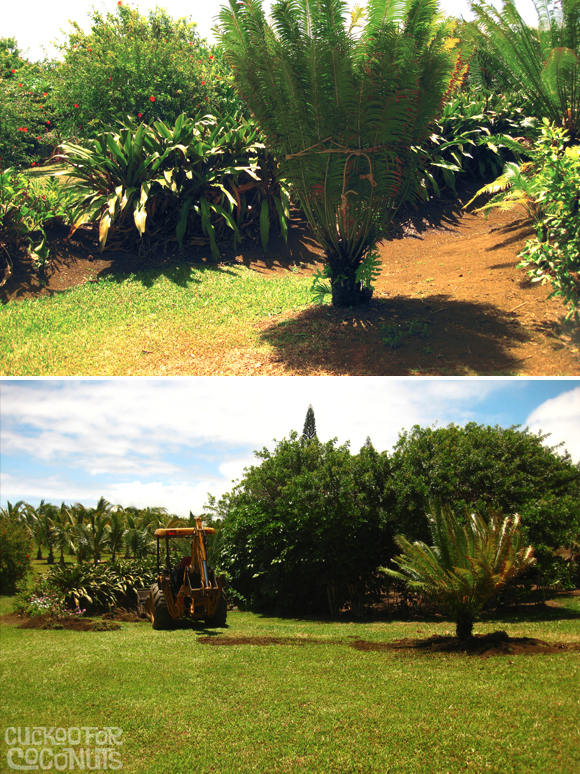 Before Murray can start making the pool and building the berm, thissago palm needs to be relocated. We replanted it at the end of the trench. 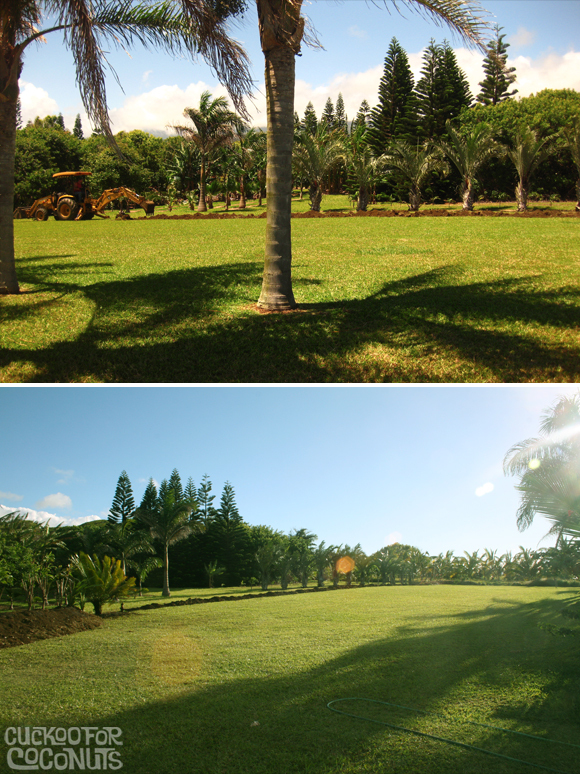 With the sago palm out of the way, Murray begins moving the earth. And just like that, in 2 hours we have a trench and a berm all ready for planting. 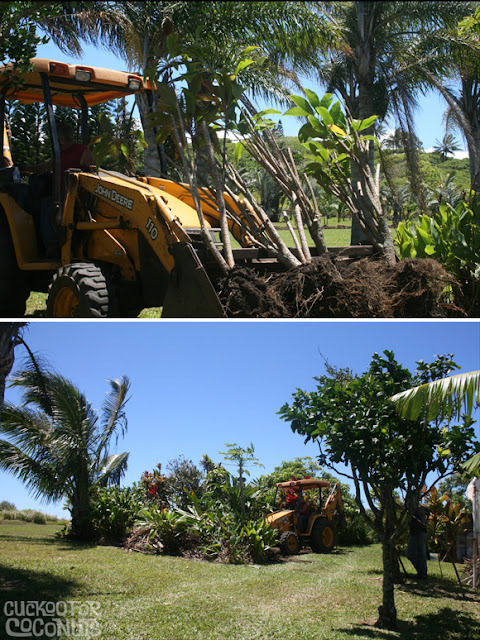 With all the areca palms out of the way, Murray is able to go in and lift out 8 mature ti plants and 6 giant lilies keeping a giant root ball attached. Murray made wells in the top of the berm. Each ti was set in place with the bucket on Murray's tractor. The lilies were a little too dense we we divided those and ended up with about 12 clusters rather than 6. We started to plant some low ground cover on the sides that have really strong root systems to help hold the dirt up. With a good root system in place, the berm would eventually slide down to the lawn and be rather useless. 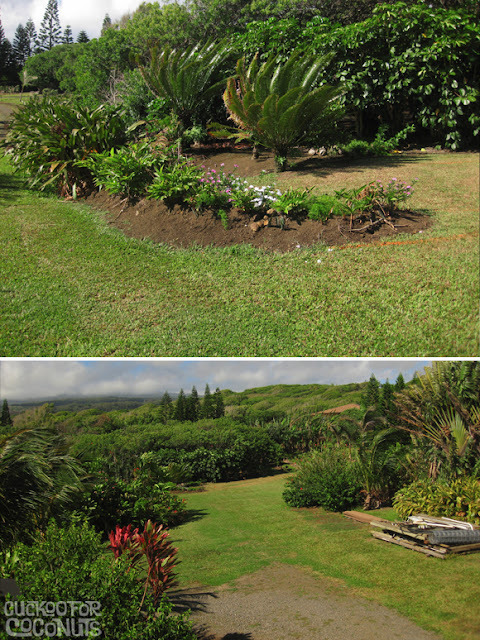 More on those plants and the areca hedge coming up.